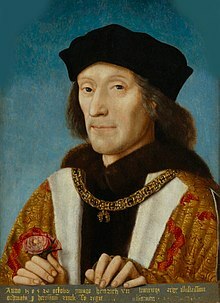 Henry VII of England has been depicted a number of times in popular culture. As a youthful Earl of Richmond, Henry is a character in the play Henry VI, Part 3 by William Shakespeare. He is also a character in Shakespeare's play Richard III. The Founding, Volume 1 of The Morland Dynasty, a series of historical novels by author Cynthia Harrod-Eagles, is set against the background of the Wars of the Roses. 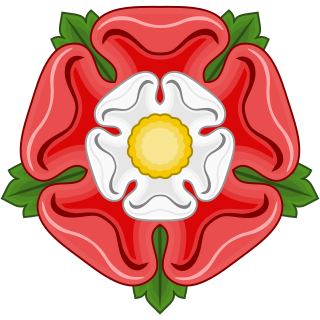 Towards the end of the novel a fictional account is given of Henry winning his crown through the Battle of Bosworth, and of the events leading up to this battle. He is the hero of the historical novel An Unknown Welshman (1972) by Jean Stubbs. In the celebrated fantasy novel The Dragon Waiting by John M. Ford, Henry is killed at the Battle of Bosworth, thus preventing the House of Tudor from ruling England. Henry appears in four novels by Philippa Gregory: The Red Queen (2010), which centers on the life of his mother Margaret Beaufort and her ambition to get him on the throne; The White Princess (2013), which centers on his wife, Elizabeth of York; The White Queen (2009), which centers on the life of his mother-in-law, Elizabeth Woodville; and a brief appearance in The Constant Princess (2005). Peter Benson in the first episode of the BBC comedy series The Black Adder (1983) It is claimed here he lost the Battle of Bosworth, but after the Yorkists were wiped out he rewrote history. Sue Parrill and William B. Robison, The Tudors on Film and Television (McFarland, 2013). ISBN 978-0786458912. 1Overlord of Britain. 2Also ruler of Ireland. 3Also ruler of Scotland and Ireland. 4Lord Protector. 5Also ruler of England and Ireland. Debatable or disputed rulers are in italics. "The Foretelling" is the first episode of the BBC sitcom The Black Adder, the first series of the long-running comedy programme Blackadder. It marks Rowan Atkinson's début as the character Edmund Blackadder, and is the first appearance of the recurring characters Baldrick and Percy. The comedy actor Peter Cook guest stars as King Richard III. Elizabeth I of England has inspired artistic and cultural works for over four centuries. The following lists cover various media, enduring works of high art, and recent representations in popular culture, film and fiction. The entries represent portrayals that a reader has a reasonable chance of encountering rather than a complete catalogue. The White Queen is a British television drama series in ten parts, based on Philippa Gregory's historical novel series The Cousins' War. The first episode was premiered on BBC One on 16 June 2013 in the United Kingdom. It was first broadcast in the United States on Starz on 9 August 2013. The Spanish Princess is a British-American drama television miniseries based on the novels The Constant Princess and The King's Curse by Philippa Gregory that is scheduled to premiere on Starz on May 5, 2019.